… of infinite possibilities, unexpected twists and turns and many dead-ends. 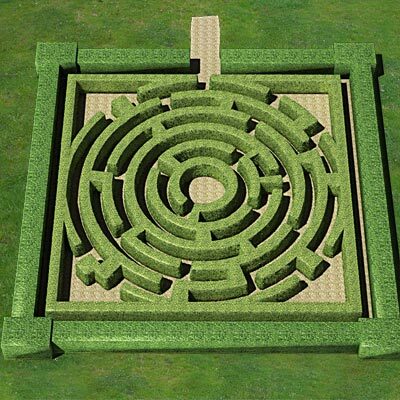 Believe it or not, you have already set up your own maze before you were born. You have detailed out every challenge, every life lesson and every soul you are going to encounter along the way. Your maze is completely unique onto you. But we forget that our maze is “of our own design” and we get caught up in our own drama of hitting that dead-end after a 5-year straight-away leads you to “nowhere meaningful.” It is all meaningful. Every twist and turn and every roadblock is there for a reason – to teach you something about yourself. It doesn’t matter that you actually hit a roadblock, what matters is how you deal with that roadblock. Do you just sit out on the floor and play the victim or do you get yourself back up, dust yourself off and pick a new direction with optimism, not regret and resentment? It is always easier to view the maze from above. Then one can know how truly simple it is to navigate. But life isn’t about getting all the answers handed to you. You have to find them for yourself. If you were handed all the answers, why would you bother being born? If there was no mystery, then we would never learn and have the extraordinary experiences of exploration and accomplishment that we have. Earth is our schoolroom and it is important that we learn to walk our maze with confidence that we will always find our own way to the finish gate when the time is right. In theory, you cannot make a wrong turn. All paths lead you down a lesson in life – an experience (good or bad). They are all worth having. The secret to success in navigating the maze is not to focus on finding the exit, it is to focus on enjoying the scenery and learning to laugh at yourself once you hit yet another ridiculous roadblock that you should have seen coming. You will get to the exit soon enough. In the interim, don’t get caught up in the “wrong turns.” Don’t give up. Learn to take a breath, choose another direction and just keep walking…. Just keep walking.